It´s been two months now that the Bolivian socialist government has shut down state-controlled postal service. Since that time, no parcels have been dispatched via Empresa de Correos de. Which has served us for 27 years. Recently, the new post office began disseminating foreign letters and packages to Bolivians. Fingers crossed, that will come to pass and we will resume having an income. We offer our humblest apologies for this situation and hope that you will take advantage of our newest offers once postal service is restored. Thank you for your patience and understanding. A PARTICULARLY FINE-QUALITY ANTIQUE ANDEAN INDIAN TAPESTRY BLANKET FROM THE TUNUPA VOLCANO REGION. Provenance: Field-collected in Tawa (Tahua) Village, elevation about 12,140 feet, Daniel Campos Province, Department of Potosí, Bolivia, South America. This region is dominated by the stratovolcano locally called Tata Tunupa , which rises to an elevation of 17,457 feet. This huge mass of mountain lies on the north edge of the world´s largest salt lake, Salar de Uyuni , and is the prominent landmark for a hundred miles. Tawa Village is located at the southern base of the mountain on the edge of Salar de Uyuni. Although the volcano is scientifically classified as dormant, it is controlled by a powerful spirit, Tata (father) Tunupa , who is anything but asleep. Tata Tunupa forms a powerful vortex of energy that is feared and revered by all local Indians. The massive mountain receives frequent sacrifices (wilanchanaka) and offerings (waxtanaka). He is the guardian of dozens of dry caves and rock shelters that have been used for the ritual internment of innumerable deceased American Indians for at least 1500 years. He also plays a very significant role in Andean mythology and native folklore. 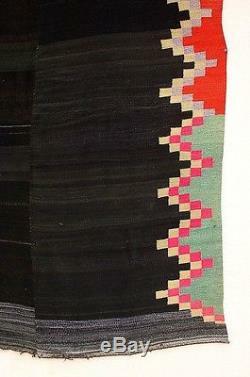 Curiously, a great many historic blankets handwoven under the auspices of Tata Tunupa exhibit unique design work and patterns some are bizarre works related to abstract impressionism and others are extremely similar to Rio Grande blankets and Navajo textiles from the American Southwest. This is an example of the latter group. This marvelous offering consists of a beautiful and authentic hand-woven, weft-faced Andean blanket dating to the early-20th century, probably circa 1920. 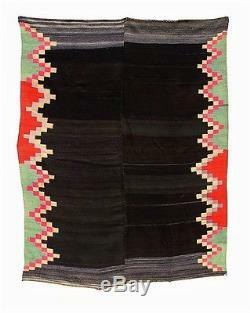 This very large, circa 100-year-old blanket was woven in two long pieces and joined with a common, hidden seam, much like certain historic Rio Grande examples from New Mexico and southern Colorado. 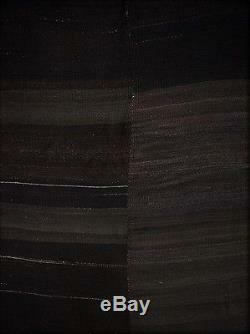 The field is in dark and light shades of black camelid wool with distal ends in variegated gray. The lateral sides are framed with blocks of color in meandering stair-stepped formation, also not unlike certain Rio Grande examples. The uneven distribution of rust and light green colors filling the edges is quite appealing. The textile is finely and expertly woven in beautiful colors. The variegated field yarns are especially attractive. The skillfully-prepared camelid wool (including fine alpaca and llama) has an attractive, almost silky sheen from age. The blanket is thin and supple with a flat, even and superb weave. It is difficult to write about how a textile feels this one is a total delight to hold and touch. The yarns are soft and very finely woven. In fact, the blanket is twice as fine as the great majority of indigenous Andean blankets, having about 12 warps per inch and up to 50 wefts per inch. These particular masterpieces of textile art are woven of two-ply yarns, mostly by Aymara-speakers, and come from the regions near the salt lakes Salar de Coipasa and Salar de Uyuni, in close proximity to the Tunupa Volcano. Related weft-faced tapestries originating from south of Salar de Uyuni in Bolivia to northern Argentina are woven of single-ply yarns mostly by Quechua-speakers. Many of the southern examples also resemble historic Rio Grande and Navajo weavings from the American Southwest. 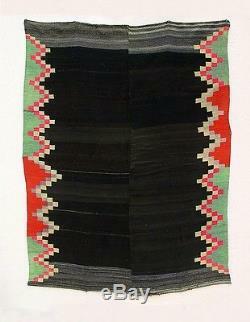 In general, post-Colonial weft-faced textiles of indigenous origins are rare from Bolivia. The iconographic relationships between indigenous andish Southwest United States textiles and those from Salar de Uyuni, Bolivia should appeal to students of textile art history who wish to delve into some fascinating exploratory research. 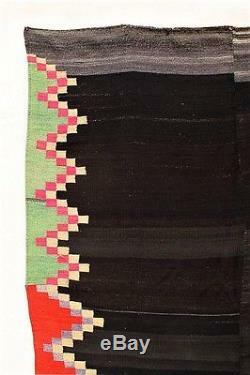 Weft-face blankets are known from only a few localities in the Andes -- their presence on the Altiplano was first reported by our own ICB investigators. Although perhaps difficult to appreciate from our photos, this is truly a masterfully-woven tribal textile and definitely one of the top ten Andean blankets of over 2000 that we have handled. Approximate Age: Early-20th century, circa 1920. Please refer to the ANDESAMAZON "DATING" TERMS. Materials: All of the yarn is hand-spun two-ply: Z-spun, S-plied. The visible weft yarns are mostly of natural alpaca and llama wool. The dyed yarns are mostly of llama wool with some sheep wool. The hidden warp yarns are fine natural camelid wool. Approximate Size: 73 inches by 57 inches. Condition: EXCELLENT, used and well-kept condition. Although vivid (as per the photos), most of the dyed colors have attractively muted from age; the purple dyes, however, are especially faded. The ends are lightly worn with some minor raveling near the center of one end. This is truly a textile masterpiece that displays absolutely resplendently. Please also refer to the photos and the ANDESAMAZON TEXTILE "CONDITION" TERMS. We promise to continue providing detailed and accurate information related to age, origin, condition and descriptions as we have for the past 15 years. PREHISTORIC, PRE-COLUMBIAN, ANCIENT = Before around A. 19th CENTURY = 1800 to 1899. TURN OF THE 19TH CENTURY = 1890 to 1910. EARLY-20TH CENTURY = 1900 to 1933. MID-20TH CENTURY = 1934 to 1966. LATE-20TH CENTURY = 1967 to 1999. TURN OF THE 20TH CENTURY = 1995 to 2005. EARLY-21ST CENTURY = 2000 to Present. ANTIQUE = Over 50 years old. VINTAGE = Over 30 years old. CONTEMPORARY = Made in the last 5 years. CIRCA = Approximately/around/within a few years of. ANDES AMAZON TEXTILE CONDITION TERMS. Terms used to describe the physical condition of textiles can be subjective and vary greatly from one observer to another. What some others call mint condition, we call good; what others call excellent condition, we call fair. Following are explanations of the terms we use. Unused -- as if recently removed from the loom. No wear or patina of any kind. 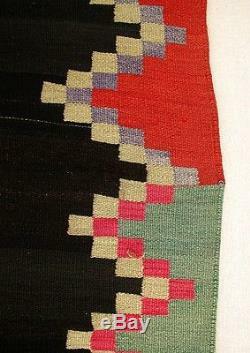 These textiles may have nubs or even loose, uncut threads from the weaving process. EXCELLENT = Usually only lightly used, often guarded or stored for many years. There may be extremely light wear, patina and sheen from use. There may also be nearly undetectable light staining or soiling from use. 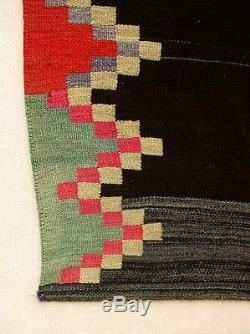 The colors may have muted ever so slightly due to age or exposure, often improving the beauty of a textile. VERY GOOD = Usually lightly or only periodically used. The surface may be very lightly but evenly worn. There are no tears or distracting holes. There may be minimal surface discoloration. Vintage textiles may have lightly darkened yarn from use and age (staining and soiling). Overall, the textile will be in outstanding condition and at a displayable distance will appear perfect. GOOD = Usually moderately to well-used. There may be light to medium staining, isolated or throughout. 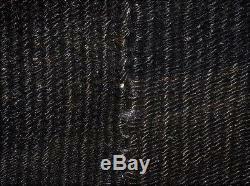 Some parts of the textile may be worn or have very small holes, occasionally exposing hidden thread yarns. Edges may be lightly frayed. 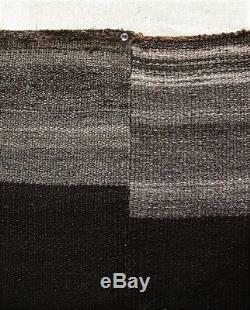 Surface discoloration due to age and exposure is common but often improving the appearance of a textile. There may be minor, light or isolated, dye run. Damage will not distract significantly from the textile when displayed. FAIR = Either well-used or moderately abused. Extensive wear is common as is some bleeding or dye run. In most 20th century cases, the colors have considerably faded. Sections of fringe or tassels may be missing. Textiles may be in otherwise excellent condition but with a single isolated sector of damage, that greatly reduces its aesthetic appeal. Most vintage tribal textiles on the market are in FAIR TO GOOD condition. POOR = Showing evidence of extreme usage and damage. These textiles do not display well and are primarily useful as study specimens or examples of sometimes very rare textiles. We believe the world can be a better place. We believe that humanity has a higher, aspiring destination. We know that through mutual respect conflicts will subside. We know that by understanding our differences we can help one another. We believe that our Mother Earth and our Universe can provide unlimited resources for every man, woman and child to live in peace, happiness and love. As stewards of the human race we have an intrinsic responsibility to do what we can to improve our world as much as possible. The majority of human existence has been dominated by so-called Native groups, also known as tribal folk, original residents, indigenous people, aboriginals, First Nations, traditional ethnicities, autochthonous societies, autochthonal cultures, et. At some point, of course, our ancestors were the same regardless of current culture, creed or color. Regrettably, in the past half a millennium, thousands of unique tribal groups have disappeared due to misunderstanding, impudence and ethnocentrism. Aspects of colonialism, capitalism, racism and politicization have directly and circuitously destroyed myriad native cultures, each a once-valuable resource to our planet. Of the nearly 7000 languages currently spoken on our planet, over 6000 are in immediate danger of becoming extinct. Nearly all, being ethnic indigenous. We believe the very few Native groups that remain on earth should be cherished and carefully supported. Unfortunately, we are on the brink of losing our connection with indigenous spirit, wisdom and traditional knowledge. For more than a quarter-century those of us behind AKATAKSA/ANDESAMAZON have dedicated our professional interests to documenting traditional South American indigenous cultures, especially through their material culture. Our field studies have led us to some of the most remote people on the continent. We have witnessed Native Americans existing exactly as their ancestors did in prehistoric times and others who have jumped from 18th-century existence to 21st-century reality in the blink of an eye. Our ethnographic investigations have resulted in valuable data related to linguistics, cultural history, ethno-environmental relationships, socio-cultural organization, cosmology, mythology, spirituality and of course, material culture. We have a detailed proposal for a magnificent cultural center aimed at stimulating interest in past and present indigenous cultures. Our unique idea is not just to show beautiful objects on display. Ours is to share the entire background of a piece, not only from a scientific or scholarly point of view but also from a cultural and spiritual perspective as well. This holistic approach to understanding indigenous material culture shall include accompanying photographs, films, recorded testimonials, music, related specimens and even field notes. We want to inspire our visitors to continue their own investigations into realms of mysterious phenomena that we really know very little about. Apart from receiving monies for researching indigenous material culture, our sales contribute toward expanding interest in past cultures and ways of life. Not only can ones´ personal environment be enhanced with beautiful and interesting objects, but the benefits of knowing about different ideologies, unique ways of life and past or nearly-extinct traditions are utterly invaluable. We hope that whatever understanding, knowledge and insights are obtained from our objects will be shared with companions, friends and especially children. In this small way, we feel inspired in preserving something of native cultures and making the world a better place. Thank you for working with us. THANK YOU FOR YOUR INTEREST AND SUPPORT. The item "FINE EXQUISITE TAPESTRY BLANKET Antique Andes Indian Masterpiece Textile TM12197" is in sale since Thursday, June 29, 2017. This item is in the category "Antiques\Ethnographic\Native American". The seller is "andesamazon" and is located in Santa Cruz, . This item can be shipped worldwide.